Each year, pro-golfers flock to The Four Seasons Hualalai Resort to participate in the PGA Mitsubishi Electric Championship at Hualalai. 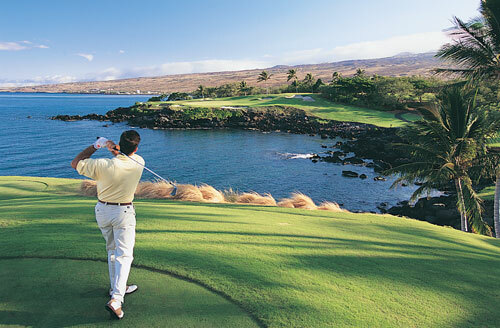 This invititation-only event is held in January at the Hualalai golf course and consists of all official money-event champions of the previous two-year’s seasons, winners of the majors since 2008 and eight professionals by invitation with 15 or more career victories, including one major. Thousands of guests and residents fly in each year to specifically view this prestigious tournament of champions. The field of some of the world’s best golfers compete for a $1.8 million purse over the course of three days and the event is televised on the Golf Channel. 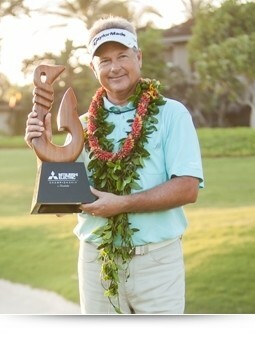 Cook, winner of the 2013 Mitsubushi Electric Championship at Hualalai. Photo Credit: Hualalai Resort. The winner for 2013 was John Cook. Cook closed with a 5-under-67 at Hualalai Golf Club to catch David Frost at 17-under 199. Cook made a 16-foot birdie putt on the 18th green. his victory ensures him an invitation back to the Championships next year. Planning ahead to attend The PGA Mitsubishi Electric Championship at Hualalai is a must, due to the thousands of guests and participants in attendance. Hualalai Hale is minutes away from the golf course, and provides you a unique blend of both privacy and ease of access to the resort.